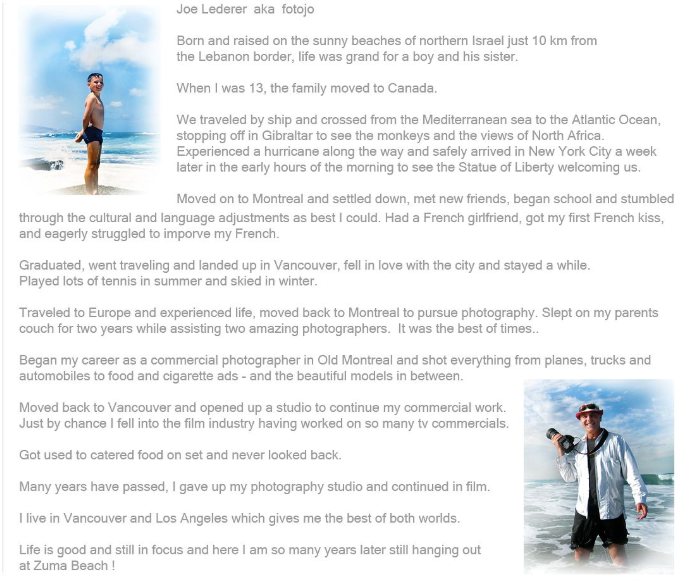 Joe began his professional life as a commercial photographer in Montreal, Quebec in the early 1970's. In the late 70's he got a first-hand look at life on a film set when visiting a friend working on the film JOURNEY INTO FEAR starring Sam Waterston, Zero Mostel, Yvette Mimieux and Shelley Winters. Shortly thereafter, he was asked to work on the film FIRST BLOOD with Sylvester Stallone, and subsequently worked with Stallone on three other films. As a young boy, Joe loved the French and Italian cinema, and in later years had the good fortune to live his dream when the opportunity arose to work with Marcello Mastroianni on the film USED PEOPLE, one of his favorite actors from those formative years. Joe has enjoyed a fulfilling and successful career working with all the major Hollywood studios on locations in Canada and in the United States. He has had the pleasure of working with such eminent actors as Steve Martin and Daryl Hannah on the film ROXANNE; Sir Ben Kingsley and the beautifully talented Penelope Cruz on ELEGY; the ever-so-funny Robin Williams in RV; Mark Wahlberg and Reese Witherspoon in FEAR and SHOOTER; THE CHRONICLES OF RIDDICK with Vin Diesel; The EDGE with Sir Anthony Hopkins and Alec Baldwin; with Mel Gibson and Goldie Hawn, to Liza Minnelli, Shelly Winters, Shirley MacLaine, Kathy Bates and Jessica Tandy. Roland Emmerich's 2012 with John Cusack; RISE OF THE PLANET OF THE APES with James Franco, and UNDERWORLD AWAKENING with Kate Beckinsale. IATSE Locals 600 in the US and Local 669 in Canada and is based out of Los Angeles and Vancouver.